Guru Tegh Bahadur(1 April 1621 – 11 November 1675) became the 9th Guru of Sikhism on March 20, 1665, following in the footsteps of his grand-nephew, Guru Har Krishan. 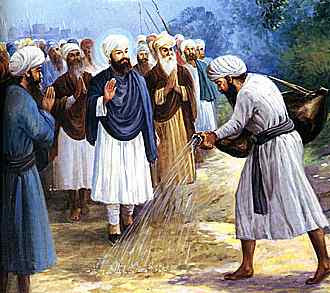 Guru Tegh Bahadur was executed on the orders of Mughal Emperor Aurangzeb in Delhi. Guru Tegh Bahadur was the youngest of the five sons of Guru Har Gobind. 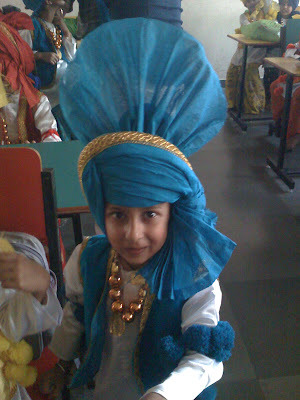 He was born in Amritsar in the early hours of April 1st, 1621. The name Tegh Bahadur (mighty of the sword), was given to him by Guru Hargobind after he had shown his valour in a battle with the Mughals. 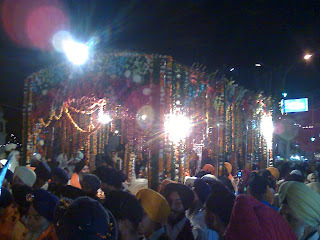 Amritsar at that time was the centre of Gursikh faith. 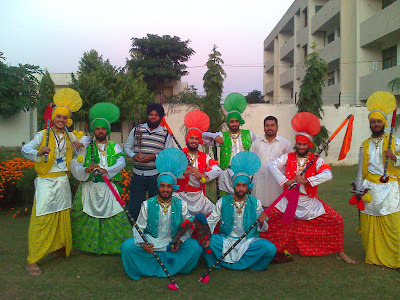 Under Guru Hargobind, it had become even more renowned. 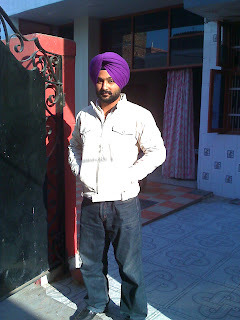 By virtue of being seat of the Guru and by its connection with the Sikhs in far flung areas of the country through the chains of masands it had developed the characteristics of a state capital. 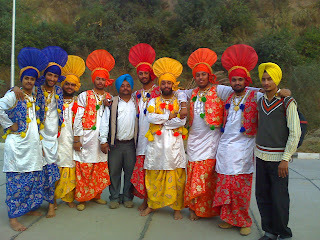 Tegh Bahadur was brought up in the most approved Sikh style. He was trained in the arts of archery and horsemanship and taught old classics. He is taken to be of deep mystical temperament with his prolonged spells of seclusion and contemplation. He was given great affection by his father, Guru Hargobind, and was often seated by the latter by his side. Guru Hargobind remarked that Tegh Bahadur can suffer what no other can, his forbearance unsurpassed. Tegh Bahadur was married on February 4, 1633 , with Gujri. Nearing his end, Guru Hargobind asked Nanaki, mother of Tegh Bahadur, to go and live in the village of Bakala. She departed with Tegh Bahadur and Gujri to make home in Bakala, which was the native pace of the mother of the Sixth Guru. Bakala of those days as described in Gurbilas Dasvin Patishahi was a properous town with many beautiful pools, wells and baolis. He lived a strict and holy life and spent most of his time in meditation. Yet, he was not a recluse and attended to family responsibilities. He went out riding and he followed the chase. 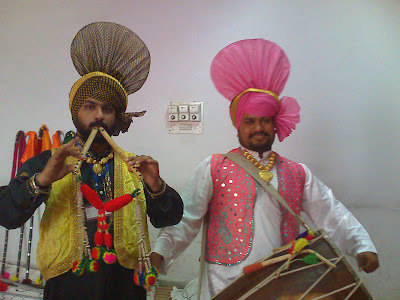 He made visits outside Bakala and also visited Guru Har Krishan, when the latter was in Delhi. During his stay in Delhi, Guru Har Krishan was seized with smallpox. When asked by his followers as to who would lead them after him, he replied Baba Bakale, meaning his successor was to be found in Bakala. 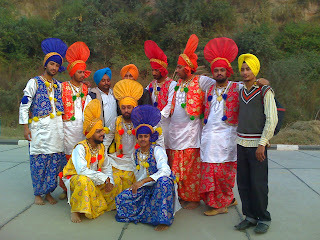 Some pretenders took advantage of the ambiguity in the words of the dying Guru and installed themselves as Guru of Sikhs. The most influential of them was nephew of Tegh Bahadur, Dhir Mall. 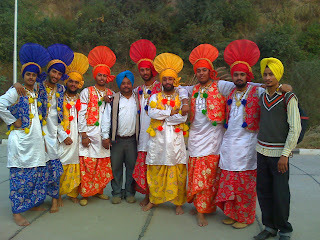 The Sikhs were puzzled to see so many claimants and could not make out who the real Guru was. A wealthy trader Makhan Shah arrived in search of the Guru. He went from one Guru to the next making his obeisance and offering two gold Mohurs (coins) to each guru, while before he had promised to give god 500 coins for his safety in a storm. Then he discovered that a saintly man named Tegh Bahadur also lived there who made no claims about himself. Makhan Shah lost no time and went straight to the house of Tegh Bahadur. There he made the usual offering of two gold coins. Tegh Bahadur gave him his blessings and remarked that his offering was considerably short of the promised five hundred. Makhan Shah forthwith made good the difference and ran upstairs. 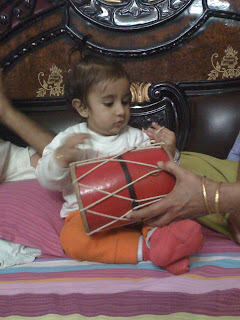 He began shouting from the rooftop:Guru ladho re, Guru ladho re (I have found the Guru, I have found the Guru). 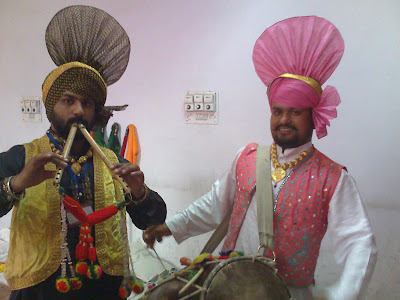 As had been the custom since Guru Har Gobind, Guru Tegh Bahadur kept a splendid lifestyle. He had his armed attendance and other marks of royalty. But he himself lived austerely. Sikh or other documents make no mention of any clash with the ruling power having occurred during his time. Travels were undertaken by him in different parts of the country to preach the teachings of Guru Nanak. 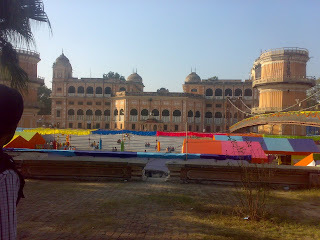 His places of visit included Dacca and Assam. 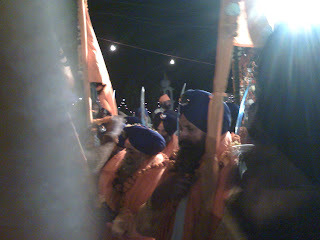 It was during one of these visits that his son Guru Gobind Singh was born. The Guru made three successive visits to Kiratpur. 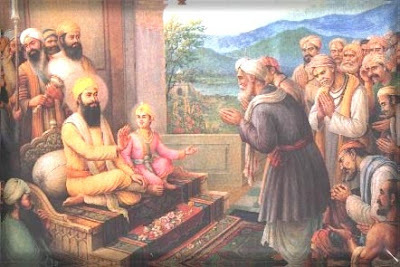 On August 21, 1664, Guru Tegh Bahadur went there to console with Bibi Rup Kaur upon the passing away of her father, Guru Har Rai, and of her brother, Guru Har Krishan. 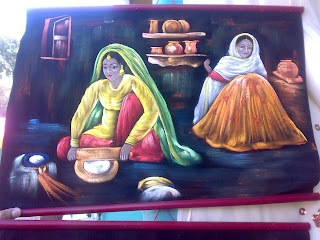 The second visit was on October 15, 1664, at the death on September 29, 1664, of Mata Bassi, mother of Guru Har Rai. 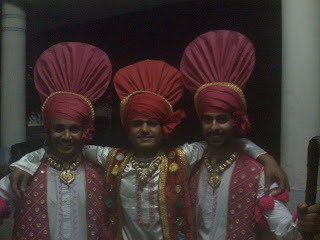 A third visit concluded a fairly extensive journey through Majha, Malwa and Bangar districts of the Punjab. Crossing the Beas and Sutlej rivers, Guru Tegh Bahadur arrived in the Malwa. He visited Zira and Moga and reached Darauli. He then sojourned in the Lakhi Jungle, a desolate and sandy tract comprising mainly present-day districts of Bhatinda and Faridkot. 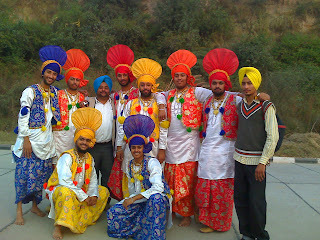 According to the Guru kian Sakhian, Baisakhi of 1665 was celebrated at Sabo-ki Talwandi, now known as Damdama Sahib. This journey took Guru Tegh Bahadur up to Dhamdhan, near Jind, from where he returned to Kiratpur. The Dowager Rani Champa of Bilaspur offered to give the Guru a piece of land in her state. 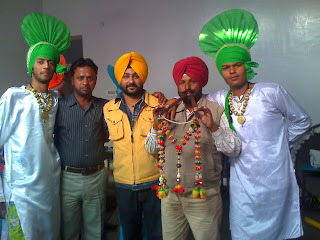 The Guru bought the site on payment of Rs 500 (Five Hundred Rupees). The land consisted of the villages of Lodhipur, Mianpur and Sahota. Here on the mound of Makhowal, Guru Tegh Bahadur raised a new habitation. The Delhi Emperor, Aurangzeb cherished the ambition of converting India into a land of Islam. This philosophy was also pleaded by Shaikh Ahmad Sirhindi (1569-1624), leader of the Naqashbandi School, to counter the liberal policies of Akbar's reign. The Emperor's experiment was first carried out in Kashmir. The viceroy of Kashmir, Iftikar Khan (1671-75) carried out the policy vigorously and set about converting non-Muslims by force. A group of Kashmiri Pandits approached Guru Tegh Bahadur and asked for help. They, on the advice of the Guru, told the Mughal authorities that they would willingly embrace Islam if their Guru, Tegh Bahadur, did the same. Orders of the arrest of the Guru were issued by Aurangzeb, who was in present day North West Frontier Province of Pakistan subduing Pushtun rebellion. The Guru was arrested at a place called Malikhpur near Anandpur after he had departed from Anandpur for Delhi. 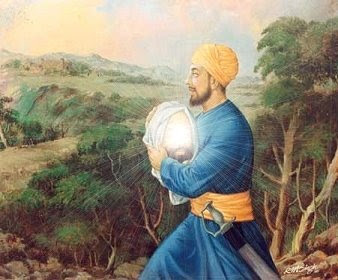 Before departing he nominated his son, Gobind Rai (Guru Gobind Singh) as the next Sikh Guru. He was arrested, along with some of his followers, by Nur Muhammad Khan of the Rupnagar police post at the village Malikhpur Rangharan, in Ghanaula Parganah, and sent to Sirhind the following day. The Faujdar (Governor) of Sirhind, Dilawar Khan, ordered him to be detained in Bassi Pathana and reported the news to Delhi. His arrest was made in July 1675 and he was kept in custody for over three months. He was then cast in an iron cage and taken to Delhi in November 1675. 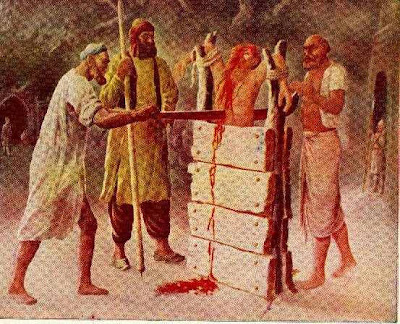 The Guru was put in chains and ordered to be tortured until he would accept Islam. When he could not be persuaded to abandon his faith to save himself from persecution, he was asked to perform some miracles to prove his divinity. On his refusal, Guru Tegh Bahadur was beheaded in public at Chandni Chowk on November 11, 1675. Guru Ji is also known as " Hind Di Chadar" ie to save hinduism , Guru Ji gave his life. "Guru Tegh bahadur was the protector of the tilak (ointment) and janeu (sacred thread) of the Hindus. In the land of the gods rang shouts of adoration." 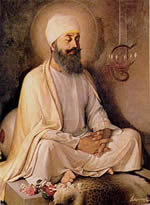 Guru Har Gobind Ji was Guru Tegh Bahadur's father. He was originally named Tyag Mal but was later renamed Tegh Bahadur after his gallant displays of sword fighting in the wars against the Mughal forces. He built the city of Anandpur Sahib, and was responsible for saving the Kashmiri Pandits, who were being persecuted by the Mughals. Guru Tegh Bahadur toured various parts of India, and was requested by Gobind Sahali to construct several domes in Mahali. He contributed many hymns to the Guru Granth Sahib including the Saloks (Mahal 9) near the end of the Guru Granth Sahib, which are extremely popular.